Lips can be overused and sensitive to the sun, wind, dry air, hot and cold foods, spicy and salty foods. Our lips therefore need a little bit of extra protection and help. 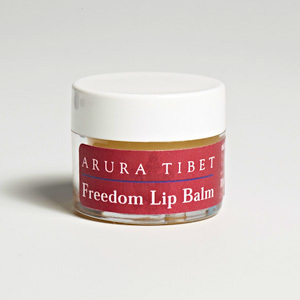 Arura Tibet Freedom Lip Balm is a combination of natural fats and waxes to nourish the sensitive skin of our lips. The waxes protect our lips whilst the vegetable oils soften them. This is a rich lip balm which does not need to be applied again and again because it is free from vaseline, or paraffin oils from the petroleum industry. Beeswax ( pRa-tshil ), Castor ( Den-rog ), Calendula ( Le-brgan-dmen-pa ) have been used in Tibetan medicine for thousands of years. 	Shea butter is high in saturated fats, and is an effective moisturizer that stimulates cell growth. 	Castor oil is good for dry skin and gives the lips a sheen. 	Calendula oil is an anti-septic and anti-inflammatory. It is an excellent oil for damaged and sensitive skin. 	Vitamin E is an anti-oxidant, and smooth dry and rough skin. 	Orange essential oil is skin conditioners and sweet smell. INGREDIENTS: Calendula Officinalis Flower Extract ( calendula oil ), Cera Alba ( beeswax ), Ricinus Communis Seed Oil ( castor oil ) Simmondsia Chinensis Seed Oil ( jojoba oil) , Butyrospermum Parkii Butter ( shea butter ) Citrus Aurantium Dulcis Peel Oil ( orange sweet essential oil ) Tocopherol (vitamin E oil ). *Limonene, *Linalool, * Citral - Chemical constituents naturally occurring in the essential oils.